*Contains affiliate links, because even bloggers need money. I wish I could tell you that this decision was so tough because I just don't know how to choose from a million albums, it's not hard for me at all. I do love music, I love all kinds of music! I know so many songs that my brain plays a soundtrack of it's own constantly. That being said, there are three albums I know I'd need. I'll admit I'd probably skip 'Don't Stop Believing' every time, but come on, Journey is AMAZING! With a track list like this, I'd be alright. 'Open Arms', 'Ask the Lonely' and 'Faithfully' alone make this album worth it. This was the most difficult. I would NEED a NIN album, no question. Pretty Hate Machine is amazing, hell every NIN album is amazing...but maybe it's because of the diversity of this album that I'd pick it. Maybe it's because I can't hear 'Me, I'm not' enough or maybe it's just the revolutionary in me who remembers the fantastic marketing around this album, or the visuals I'd have while listening to 'Survialism'. Oh Trent, you're a beautiful man and that scarf just makes you sexier. Grrr. There you have it! My 3 must have albums. What 3 albums would you choose? It would be very difficult for me to choose three cds to take with me if I were on an island... I'd definitely have to think on that one for awhile. I would have a hard time picking just 3 albums. I love music so much it really gets me through the day. I would have to have Adam Lambert for sure! I wouldn't mind not taking music with me, but rather a music book, where we can sing along with my kids etc. Yes! Journey is a great call. Although I don't know if I'd like to limit to just 3. Sounds like a great 3 albums! I honestly don't think that I could choose just 3. It would be too hard! 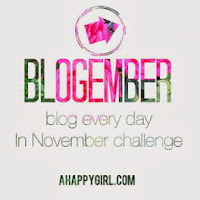 I love the Blogember idea and also the albums you chose. Everyone's music taste is so different so it's fun to see what we all will pick! Thanks for sharing yours! I am not sure what I would take. Sadly I listen to music daily but have no idea who sings what. I never thought about it! I love your choices listed though. I'm on board with your choices. I have that Journey album... and have seen them and NIN in concert! (not at the same venue). Ya can never go wrong with a bit of the clash either! I adore NIN, Trent Reznor really puts on the best shows. Oh wow, I honestly have no idea what 3 I would choose. I'd have to think about it for a little while! I haven't heard of any of these people! I'm so out of it!